Check out the latest and greatest from our BCP friends & family: new poems, new books, prizes, reviews, essays, and video! Every week we try to bring to you news about the good citizens of the greater Bull City. 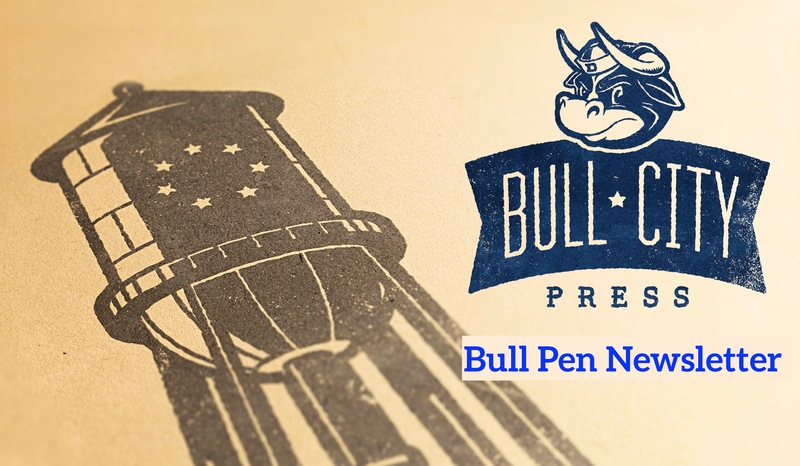 Enjoy this week’s BULL PEN. Anders Carlson-Wee’s Dynamite, winner of the 2015 Frost Place Chapbook Competition, reviewed by Shawn Delgado at storySouth. Chloe Honum, 2016 Frost Place Chapbook Competition/BCP editors’ selection for Then Winter, with “Early Winter in the Psychiatric Ward” at storySouth. Khadijah Queen’s, contributor to Another & Another: An Anthology from the Grind Daily Writing Series, new book Fearful Beloved (Argos Books) reviewed at Scout Poetry. Carmen Maria Machado, contributor to INCH #20, interviewed about her book Her Bodies and Other Parties (Graywolf Press), at NDR Magazine. Elizabeth Scanlon, participant in the Grind Daily Writing Series, with “Where Was I” in Public Pool and find three more poems and an interview w the poet at Okey Pankey. Congratulations to Elizabeth for her Pushcart Prize awarded for “The Brain Is Not the United States” from the Boston Review. Matthew Olzmann, BCP editor and participant in the Grind Daily Writing Series, with three poems at the Kenyon Review. Michelle Peñaloza, contributor to INCH #23, reviews Rick Barot’s Chord (Sarabande) at the International Examiner. Rebecca Hazelton, BCP editor, with the essay, “Why Write in Form? Mastering the traditional ways to forge new ones” at the Poetry Foundation. Liz Ahl, participant in the Grind Daily Writing Series, with “Snow Fort” at Panoply. Rachel Richardson, contributor to INCH #25, featured on the podcast Poetry Off the Shelf. Rick Bursky, participant in the Grind Daily Writing Series, participates in a stunning film marking BOA Editions’ 4oth Anniversary. Luke Hankins, contributor to INCH #23, is interviewed about Orison Books at Best American Poetry blog. And congratulations to Luke for winning the Dash Journal 2016 Poetry Prize. Congratulations to Reginald Dwayne Betts, contributor to Another & Another: An Anthology from the Grind Daily Writing Series, and now finalist for the Media for a Just Society Award. Hooray! Aimee Nezhukumatahil’s, contributor to INCH #3, World of Wonder will be published by Milkweed Editions. Kathleen Rooney, contributor to INCH #16, reviews Zoe Zolbrod’s “The Telling” at the Chicago Tribune. Mahogany Browne, participant in the Grind Daily Writing Series, with “the best time” at Split This Rock. Ellen McGrath Smith’s, participant in the Grind Daily Writing Series, book Nobody’s Jackknife (West End Press) reviewed at Eleventh Stack. ENTER NOW: Phillip B Williams, contributor to the INCH, will serve as final judge for poetry submissions to the Cossack Review First Annual October Prizes. SUBMIT.